Manchester United defender Donald Love has Scotland midfielder Darren Fletcher to thank for his call-up to Danny Lennon's first national under-21 squad. Rochdale-born Love has already represented the Scots at under-17 and under-19 level. But Fletcher, who moved from Old Trafford to West Brom in February, alerted Lennon to Love's ability. "I welcomed that call as I did other calls," said Lennon as he named his squad to face Hungary in a friendly. Love, 20, is one of three players in Lennon's squad who have yet to make a first-team appearance for their present clubs - the others being fellow defenders Dom Hyam, of Reading, and Stephen Kingsley of Swansea City. But Lennon, who is in temporary charge for the 26 March game, said: "I went to see the player and spoke to him on several occasions. 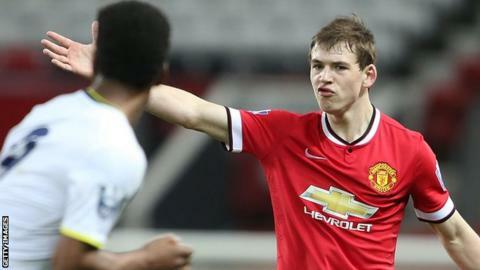 "You don't play for a big club like Manchester United unless you have ability, so we are delighted to have Donald along. "He has been involved at a younger age and it is another milestone in his career. "He can play a couple of positions, which is always handy. He is a welcome addition." Lennon stressed that he had been involved in an intensive search for new talent to add to the squad he inherited from Billy Stark and was planning for the long term despite the uncertainty of his own position beyond the match in Hungary. SFA coach Donald Park and Gary Caldwell, the former Scotland defender recently forced to retire while at Wigan Athletic, will also have roles. "Donald Park will assist me and Gary Caldwell will come out and observe, but I will get him involved," said the former St Mirren and Cowdenbeath manager. "That will be fantastic and the young players will enjoy that. "We have a job to do, which is to get to the next major tournament and the qualifiers begin in December. "This age group hasn't qualified for a major tournament for over 20 years and that is something that I would like rectify."